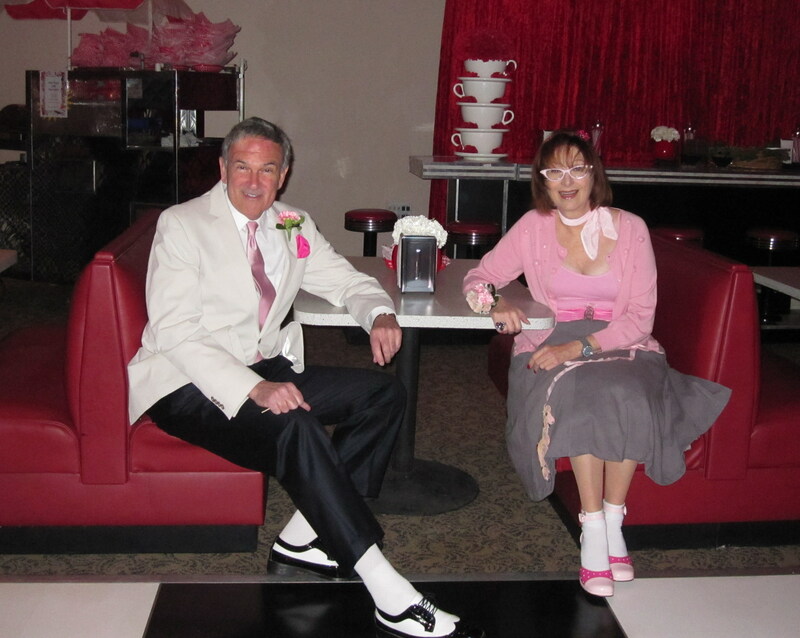 Unlike the writer of this column, my friends Arnie and Jackie look for any excuse to hit the dance floor. Just ask any woman in America, and she will assure you that she has a better chance of talking her man into joining her knitting club than trying to coax him onto any dance floor. The subject of dancing came up recently while attending a local wedding. It was a casual backyard affair, and of course, there was the dreaded dance floor in the corner of the yard that offered one more chance for public humiliation. I could already envision being dragged onto the floor against my will by some woman at my table who wished to unleash her inhibitions for one evening at the expense of those of us who preferred to remain happily inhibited. The occasion took me back to high school days at the Friday night dances at the local community center. For shy boys like me, the notion of hanging out with cute girls with whom I shared classes was both exhilarating and terrifying at the same time. I usually found a convenient hiding spot behind two friends where I could observe the dance floor, but also stay out of the direct line of fire. There always seemed to have been one guy who broke the stereotype of the reticent male dancer. I didn’t have anything personally against Floyd Mead. I just hated the fact he could dance so well. He could fox trot like Fred Astaire and jitterbug like James Brown. Many of us were just happy to get through a slow dance without fracturing our partner’s big toe. In retrospect, I should have followed through with dancing lessons like a couple of my friends. I did attend one lesson at the Arthur Murray Studio before calling it quits. I went there hoping to learn the simple box-step movement, but instead was taught the Viennese Waltz, which might have come in handy if I had been living the aristocratic life in Moscow before the Bolshevik Revolution. Many of us just wanted to know the basic footwork, so we’d have an excuse to stand next to a cute girl. I eventually adopted the motto of an old friend when asked by a girl to dance. I usually replied, “I don’t really dance, but I’d be happy to just hold on while you do.” I’ve found most women are quite forgiving regarding their partners’ dancing limitations. They just simply want to dance and we are there as nothing more than utilitarian props. In later years, I met the adult version of Floyd Mead in my pal Arnie. I always wondered why he was constantly encouraging couples to get married until I finally realized that their wedding would afford him an extended evening of dancing pleasure. He even keeps a pair of two-tone wingtips in the closet, just in case the occasion features a “fifties” theme. While growing up, Arnie’s favorite movie star was not Henry Fonda or Jimmy Stewart. You guessed it—Fred Astaire. I’ve often wondered if my choice of colleges was secretly cloaked in my avoidance of the dance floor. I picked Baylor, a Baptist school that did not allow on-campus dances until 1996. Actually, off-campus dancing was common back when I attended, and the thought of breaking the rules made dancing considerably more appealing. We felt like such repressed rebels back then that we decided the 1980s movie “Footloose” must have been based on our experiences. After seeing the movie “When Harry Met Sally,” I had to admit that I was guilty of emulating Billy Crystal’s character (Harry Burns) when dancing to rock and roll music. Harry described men’s contorted facial expressions as the “white man’s overbite,” in which we clinch our front teeth over the lower lip to give the impression that we know precisely what we’re doing. Now I’ve finally come clean and admitted that I’ve actually been dancing for many years. However, sometimes it just takes a while for the music—or an aggressive dancing partner—to get me out of my seat. I’ve never really had much range when it comes to dancing styles, but I can do a pretty mean “twist” when the deejay spins some sixties’ music. So, the next time you catch me playing the wallflower at a big wedding bash and need a dancing partner, it might be best to approach my table after they play a song I can dance the twist to. But better yet, you might consider holding out until the Viennese Waltz becomes the next big national dance craze, and then I promise you, I’m all yours. Bob Vickrey’s columns appear in several Southwestern newspapers including the Houston Chronicle and the Ft. Worth Star-Telegram. He is a member of the Board of Contributors for the Waco Tribune-Herald and a regular contributor to the Boryana Books website. He lives in Pacific Palisades, California.